For as long as most of us can remember, WordPress has used TinyMCE as an interface for content creation. The intention behind using such an editor was to make blogging accessible to all – no need to learn HTML; just get writing. As the world’s most popular content management system, WordPress deserves the world’s greatest content creation interface. Not many would argue that TinyMCE deserves such recognition however. In this article we’re going to explore the history of the WordPress text editor, its current incarnation, and what the future holds for content creation in WordPress. We’ll also explore what WordPress can learn from other en vogue content/blogging platforms. Many moons ago, WordPress took a big step forwards by packaging a visual editor into its interface. Working with the team at TinyMCE, WordPress was now available to everyone – with or without HTML experience. 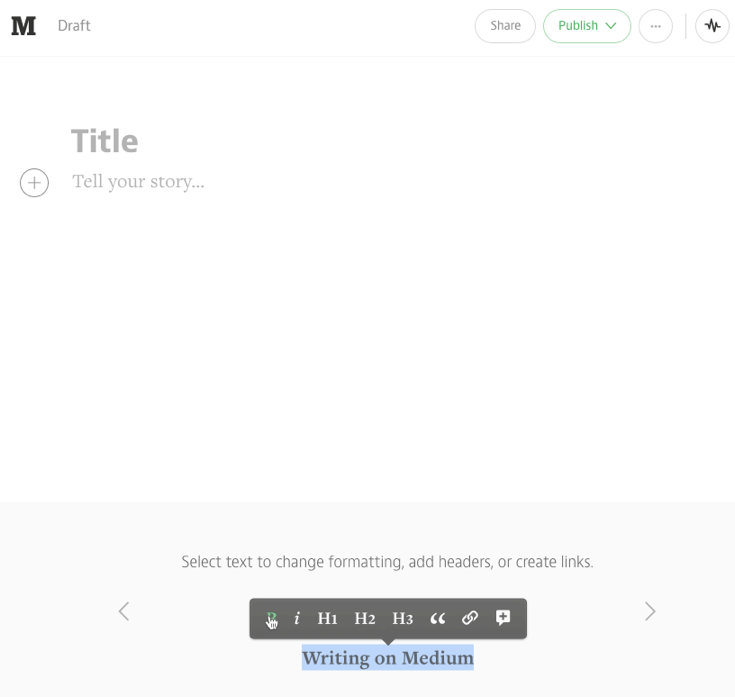 WordPress 2.7 – Coltrane – with the familiar TinyMCE visual editor. This new means of creating content led to an exponential rise in WordPress’ popularity, as suddenly anyone who had experience using a bog-standard word processor could now write and publish content to the web using (what was at the time) a relatively unknown content management system. Adding text, tables, images and hyperlinks became as easy as clicking a button, and the blogging world loved it. TinyMCE was not without its issues, sometimes (often?) coming a cropper in various manners, but the editor continued to be refined and improved upon in subsequent releases. It hasn’t attained perfection to date, but continues to offer a solid solution for content creation. 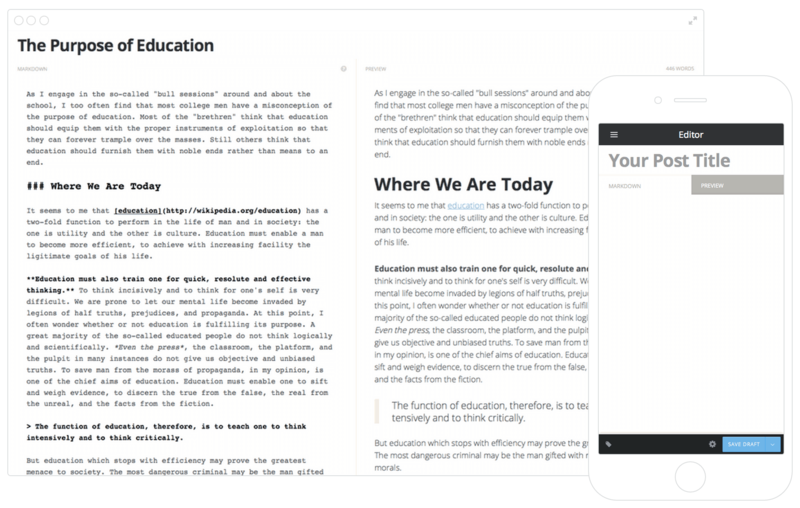 Introduced with version 3.2, WordPress’ new distraction free mode (or ‘Zen mode’) enabled the user to remove just about everything from the screen to focus entirely on writing. It pushed the editor to what one might typically refer to as ‘full screen mode’, melting away all of the buttons and toolbars that cluttered up the WordPress interface. The writing process was as close to mimicking a Microsoft Word document as it would ever be (although WordPress devs would probably consider that an insult), and by removing all distractions, it allowed creativity to rule supreme. It also removed that sneaky Publish button, which I’m sure all of us have accidentally pressed at least once during our WordPress lives. Currently on version 4.1, the TinyMCE editor has not experienced a major overhaul since 2.0. While there have been many small-ish tweaks and upgrades, the content creation interface has stayed pretty much the same for WordPress. Which begs the question: is WordPress at risk of falling behind? Or perhaps even worse, is it already behind the times? While the TinyMCE certainly enables anyone who can work a keyboard to create content, it does have its certain limitations. For starters, what you see is not what you get. The editor interprets what you have written within the limitations set out in its stylesheet. Aspects such as your chosen theme dictate how your content actually looks, and although the editor’s stylesheet can be edited, most people don’t have the time or ability to do so. Furthermore, we’ve been spoiled by alternatives (discussed below). For many, TinyMCE is so far away from the cutting edge as to be positively blunt. We also have the updated distraction free mode, which has caused no small amount of consternation within the WordPress community (with yours truly among the unhappy). The concept is still the same – essentially a full-screen editor to create content with no distractions. The distraction-free editor in its ‘just as distracting as the normal editor’ mode. There are of course alternatives to WordPress when it comes to creating content. Now I’m not for a minute going to suggest that you dump WordPress and move onto a competitor. While its content creation interface may not be the best out there, in my humble opinion, it is hands-down the best all-round solution for the majority of bloggers and webmasters. However, WordPress certainly could learn a thing or two from newer kids on the block. Originating as a kickstarter campaign, open-source platform Ghost is quickly increasing in popularity after initially being released to the public in 2013. Ghost has essentially headed in the completely opposite direction to WordPress; a simple editor versus a full blown content management system. By removing the somewhat clunky interface, Ghost enables users to focus completely on their content. One of the drawbacks of content creation in Ghost however, and why WordPress became and still is so popular, is the need to learn Markdown in order to use the platform. Markdown isn’t exactly difficult to learn and can probably be picked up within fifteen minutes if the user has limited experience with coding, but if you have never coded before, and don’t particularly want to learn how to, WordPress still reigns supreme. The chaps over at Medium have achieved this by removing a lot of the power that other editors have, meaning you arguably don’t have as much control over your content. It’s perhaps a compromise of style over substance. The consensus seems to be that people want a blogging platform that performs like Medium, but with the functionality and customization that comes with WordPress. Which is no mean feat. Looking at the release notes for WordPress 4.3 and 4.4, it seems that there are no major changes planned for the editor, with the developers preferring to work on the mobile experience (which is understandable). However, there is a new front end editor plugin which should be coming to core at some point. It seems that the focus is definitely to improve the what you see is what you get experience rather than move to something such as Markdown, which would no doubt cause uproar. Currently you have to create a post in the back end of WordPress, preview it, and then post it. Edits here and there inevitably compel you to preview more than once, leading to a lengthy cycle of edit, preview, and repeat. It’s a time-consuming process for the perfectionists out there, which is what the front end editor promises to eradicate. The new editor will enable you to create pages directly from the front end of your site, so you can immediately see how the content will look within the context of your design. You could still navigate to the back end editor for more in-depth aspects such as SEO, categorizing and tagging, so there shouldn’t be any loss of functionality. It wasn’t too long ago that the front end editor felt like a tangible dream, but as it stands, its integration into core could be quite some time away. The attention that alternative blogging platforms such as Ghost and Medium are currently receiving arguably demonstrates that WordPress’ content creation functionality has its limitations. However, the fact that WordPress currently powers over 23% of the web implies that people would desperately like to see the elegance of newer content creation interfaces coupled with the workhorse power of WordPress. A lot of us are dreaming of a future where dashboards cease to exist within the content creation process. WordPress’ distraction free mode fulfils this to a degree, but it is not without its flaws (especially since its latest incarnation), and doesn’t deliver a true what you see is what you get experience. In the meantime, we pin our hopes on a half-abandoned plugin that was once imminently destined for core. I for one hope that it is resurrected soon, as I see the content creation interface as one of the most important elements of WordPress core. The beauty of WordPress, and partly the reason for its popularity, is the fact that absolutely anyone with an Internet connection can use it. However, we must not stop there and claim an outright victory for accessibility. WordPress remains a platform that has benefited from mass adoption, and we must strive to push it further in terms of its content creation interface and capabilities. The likes of Ghost and Medium serve to demonstrate that there are a lot of possibilities. If the new front end editor becomes a part of core, and is as seamless as reports are suggesting it could be, we may just get the what you see is what you get experience that we’re are looking for. It will also pretty much guarantee WordPress’ place as (dare I say it) king in a land of subpar blogging platforms. What are your thoughts on content creation in WordPress? Share with us in the comments section below! I absolutely agree with Georgia. Of course other tools and possibilities will be developed – sometimes they end up in a simple hype, sometimes they stay and evolve further. But WP as the pioneer and ever strong platform with uncountable developers worldwide will never be outdated. Because who or what can outdate a daily progressing platform? Although users will always want the best, WordPress has always been a workable and sturdy platform to get your message out. Best of all, it remains free! I’m with you, Georgia. I’ve been using WordPress for about 11 years. I’ve stuck with it simply due to the community behind it. It’s an unstoppable force with an irresistible price. As a Ghost user I like the concept of using markdown when I’m blogging and just want to write and wish WP had this as a built in option. For freelancing work it would be nice to see an overhaul of the TinyMCE editor IMO it needs some reo-organization I work with the CKEditor in Drupal for work and find it more streamlined and useful. I think WP is too big to fail at this point, even if certain aspects fall behind from time to time. Just remember, that’s what they said about Microsoft. Not dead, not by far, by far from what they used to be. If only I’d kept my Apple stock that I purchased back in 1995 at $15 per share. All of these platforms are pretty cool. I don’t know about everyone else, but I generally write out my content in word and simply copy & paste it over. Well, this is faintly interesting, but my guess is the largest percentage of users are more interested in wordpress as a website building platform, than a blog . Since blog page formatting has come a long way in many excellent themes, something I would be curious about is the possibility of applying a blog page format to other pages, and from what I have seen so far, Divi itself and other page builders facilitate the look, but not the functionality. The Grid is a failure. I think that the desire to “just write” is that which is behind the times. In modern communication, formatting including the hierarchy and subordination of heads – text – bullets, plus images and video are important. Readers need to be able to scan the highlights, then dig in if they have the time and interest. Images can convey a lot in a short amount of time. The ability to call out certain key phrases or sentences with bold or italic enable people to speed read. The ability to add hyperlinks is critical for modern relationships which a modern communicator needs to provide. I personally like the ability to toggle between an almost WYSIWYG editor and hmtl source mode. I think the front-end editor will be great and save time. I work with a very luddite sector of the population–mental health professionals– and they are a very late-adopting, technically unsavvy and even averse group, in general. I can’t tell you how many of my clients have been totally unwilling and unable to even deal with the WP backend. They refuse to blog. And this inspite of my bending over backward to train them. A front-end content creator is the ONLY real solution IMHO. I keep looking for one that is easy and readily available. This has been true for my clients, too. Even teaching them to toggle between a preview tab and a tab with the WP text has been difficult. If WP goes to seamless front-end editing it’ll be a huge leap forward for many reluctant users, and I would bet WP will increase exponentially from its 23% of the market. I agree as well. Speaking from the small business website building perspective, I’d say that not only will the market share boom IF a good front end is developed and maintained (even just as a free/official plugin) but that if this glaring flaw in the software isn’t fixed and soon then that potential will NOT be met. Too big to fail? Seriously? Not even remotely close. Easy for anyone to use? It is NOT. But it could be if resources get poured into the Front End Editor plugin. But knowing now that some people do want it, I’d think the best solution is in plugins. We should be able to prefect the distraction free mode as well as make other editor modes available. I don’t want fewer options available, I want more – such as better ability to insert and manage script without a fight, and a wysiwyg content creation area. Really, WordPress needs to improve seriously the TinyMCE. WordPress must put the focus on non-experience users which any help is always welcome. We currently spend hours teaching about how to write in WordPress for our clients and I hope this will be less in the future. Thanks for the post. 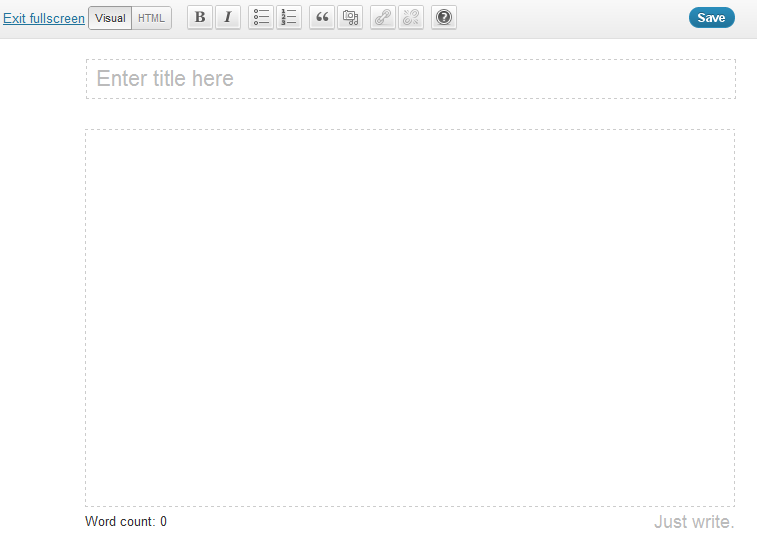 The worst thing about WordPress is the lack of a WSYWIG Editor! The standard editor is rubbish because of the Edit>Preview>Edit process which is a real waste of time. I love WordPress but the editor is way behind the times. Distraction free mode? Fine, but I never use it. I´m currently building a new website with wordpress (still using jimdo for the time being) and I have spent some time figuring out the WordPress text editor. It´s certainly not intuitiv user friendly or modern and if wordpress wasn´t so great in everything else, it would be a reason for me to not work with it. Jimdos content creation system is even more complicated though, because there is no real editor and you can´t paste your content in and just format it with righ clicks. Well – you can, but it takes a looooot of time to get it right. I expect my time for formatting my content to be shorter once I´ve moved to wordpress but it still is a drag. And so is producing goog looking text with most text widgets. WordPress still is a blogging and writing plattform, meant for everyone not just those who know CSS. Making the writing process easier has been one of the core interests of wordpress as to get more users to actually post content. But right now it takes me almost the same time to format my texts than to write them and that is just not practicable. If they want more people to post content, they should change that fast. I’m pretty happy with the editor as it is. I’m OK with html so I always work in Text mode and disable the Visual mode. Be nice to see a few innovations, but like I say I’m pretty happy as is. I use WP on all my sites and also develop WP based sites for clients. For me the text editor is fine – I just open a preview in another tab and click back and forth between the editor and the preview, updating as needed. Some of my clients, however, if they blog, like the visual editor mode, so early in the training, I assess their abilities and focus more on one or the other. Most of the major differences I encounter between the editor and the live page seem to be caused by plugins, which I try to minimize the use of as much as in feasible for each client. But I do think that a real-time preview pane of some sort would be helpful, regardless of their technical expertise. Nevertheless, I’m not likely to stop using WP, even if they do away with the TinyMCE entirely – it’s just too versatile to walk away from. When blogging, nothing feels better than when you can straight forward see how your content looks in front of its audience, and that’s when the front end editors come in. However, I do use Microsoft Word most of the times and paste my content to whatsoever. But I also couldn’t agree more on WordPress needing some real editor changes, ASAP. The blogging platform is changing, and it’s changing fast. And for the moment, WordPress doesn’t seem to catch up. I think it should be mentioned in the article: that present wordpress editor has better embedding support – for youtube or other videos, tweets, audio, galleries, iframes etc. I never saw such amazing support on any other platform. But I agree that there are few things that has to be refined: distraction-free mode, making new lines (sometimes it is quite paintfull to understand when you just want to break line, but not create new paragraph, and you have to switch to text mode and remove one blank line), embedding nested shortcodes (I thing, that nesting option must be set up as a standart for all shortcodes, otherwise yuo never know what could happen on the frontend). I am not a coder, and never will be. I look for easy solutions to creating professional looking and functioning websites without the need to learn brain melting code. I use WordPress for several of my sites, but I have never found it to be very easy to use. If anything, it can often be quite confusing and a bit overwhelming. Then I discovered a plugin called MotoPress. MotoPress enables me to drag and drop images, video, headlines, paragraphs, and many other elements to wherever I want to place them on the page. If I’m not satisfied with a particular element’s current location I simply drag and drop it to where I want it. It all happens in real time, and WYSIWYG instantly. It has made my site creation so much easier, faster, and more professional looking. The bottom line is that most people want simplicity of use, and great functionality. The average user is not a code geek. They are your average person wishing to create a website for their personal or business use. Some theme developers are making life and work easier for us, but most people still find WordPress a bit intimidating, even after using it for a while. MotoPress has made my web life a lot easier and less stressful. Hey, Elegant Theme Developers, if you want to ensure your future, then take some advice from a current customer. Create an easy to use website development plugin for your themes that make designing a site as easy as MotoPress, and you will find you will have a loyal customer base that will stick with you through thick and thin. I installed your Divi Theme, but found the slider controls unreliable. I deleted Divi, and installed a theme I purchased from Mojo Market Place, then installed MotoPress. Combining the shortcodes and functionality of the theme with MotoPress opened up a world of possibilities for me, and made my site creation fun instead of frustrating, and without requiring a steep learning curve. I installed your Event Theme, which was actually why I became a customer in the first place, but it never worked. Same solution, delete and install another theme form a competitor, along with MotoPress. Problem solved. I will continue using quality premium themes and MotoPress, until something better comes along. For now, this works well for me. I can easily create pages to sell products, write posts, whatever I desire, and it’s drag and drop easy. I also use a powerful and easy to use HTML site developer that easily creates beautiful sites, without learning code. It is the ultimate drag and drop HTML editor. I know I’m not the only person looking for easy to use solutions from my sites and blogs. I talk to people almost daily seeking the same kind of solutions I have found and use. Give the people what they want, not what you want them to have. Make it brain dead simple for them to use, and they will climb over flaming wood to buy your product. Give me something that makes it easier for me to create sites, and give me the kind of control I desire, and enable me to do that without learning code, and you will have a loyal customer who will sing your praises to everyone I meet. You coders are geniuses, and I have the deepest respect for you and your abilities. Please, help me, and other like me. Help me by making it easier to create beautiful and functional sites with WordPress. I know you can create beautiful sites with your vast coding knowledge, but I can’t. I’m not a coder. Help me create sites that look like a coder created them. Is that an unrealistic request? I hope not. One thing i like from WordPress is the way even a 10 year child can start a blog because the WordPress editor doesnt need any coding knowledge. I think that’s the biggest challenge facing WordPress at the moment: balancing innovation with backwards compatibility.